China's new Mandarin test has raised public debate, as some experts doubt its effectiveness in enhancing native speakers' language abilities. 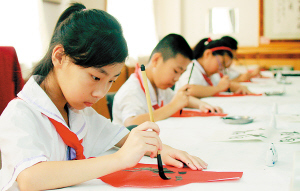 Students practices Chinese calligraphy in this file photo. A common worry is the perception that younger generations have forgotten how to write Chinese characters since they heavily use computers and mobile phones. The National Education Examinations Authority (NEEA), a body affiliated with the Ministry of Education, said in August that the Chinese Proficiency Test, which will debut after three years' preparation, is designed to promote people's interest and ability in their native language. The test evaluates listening, speaking, and reading and writing abilities at six different levels, while also providing advice to examinees on how to improve their Mandarin. The test was conceived amid the perceived withering popularity of Chinese culture and language, as more and more Chinese people have rushed to English training classes instead of perfecting their native language, because better English can mean a higher salary. A common worry is the perception that younger generations have forgotten how to write Chinese characters since they heavily use computers and mobile phones. Schools report that students' compositions lack creativity because Chinese exams focus on formal knowledge and ignore the ability to write effectively. The new proficiency test follows a previous one initiated by the Ministry of Labor and Social Security seven years ago, which failed to gain much influence. Despite government efforts, many experts say that to maintain and improve native speakers' skills requires favorable study circumstances, and a test will do little to help. Xie Xiaoqing, a professor at Beijing Language and Culture University (BLCU), said that the weakness of people's language skills resulted from inappropriate teaching methods that ruined children's curiosity. Although students have to learn Chinese language for 12 years from primary school to high school, a large number of college students still cannot properly use it, according to the Ministry of Education. In a ministry-sponsored test to evaluate the language abilities of some Beijing college students last year, more than 30 percent failed. Pang Fei, who received a PhD from Peking University and established the Yidan School, a non-profit NGO to advocate Chinese culture, has attempted to boost students fondness for Mandarin through classical Chinese literature. Pang believes the first step of rebuilding native-language abilities comes from rebuilding society's order, as the traditional Chinese lifestyle, manners, rituals, and philosophies are withering in front of Western-oriented modernization. "Depending on a test is not enough," Pang said. "Only if language teaching is integrated with society and bolsters citizens' morals can it actually take root in people's hearts." Pang says every Chinese character is a light, but now many have dimmed. "We need to re-light them to provide us a guiding light," Pang said.